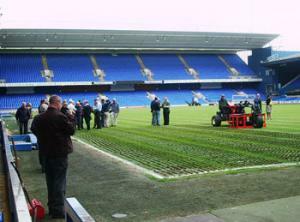 Terrain Aeration’s Deep Drill, acquired when the company bought the assets of C&P Soilcare has made its debut appearance, (following an extensive overhaul) at Portman Road, home of Ipswich Town Football Club. Working at 5 inch spacings with 60 holes per square metre the machine drilled to a depth of 300 mm on the wettest, darkest corner of the ground that receives considerable wear. Alan, who was the first groundsman to see the Deep Drill when it was delivered from the USA in 1992 and has used it twice since then, supervised scarification immediately after treatment before top dressing. The Deep Drill (nick named ‘Phoenix) performed the operation during an open day at Portman Road organised by and for members of the IOG. Alan, who fully endorses the machine, gave a presentation on its effectiveness and the benefits he has experienced at Portman Road.